The Bible's authority is constantly under attack in today's culture. It is important that Christians prepare themselves to address the challenges for their own faith and for overcoming intellectual challenges in their evangelistic efforts. 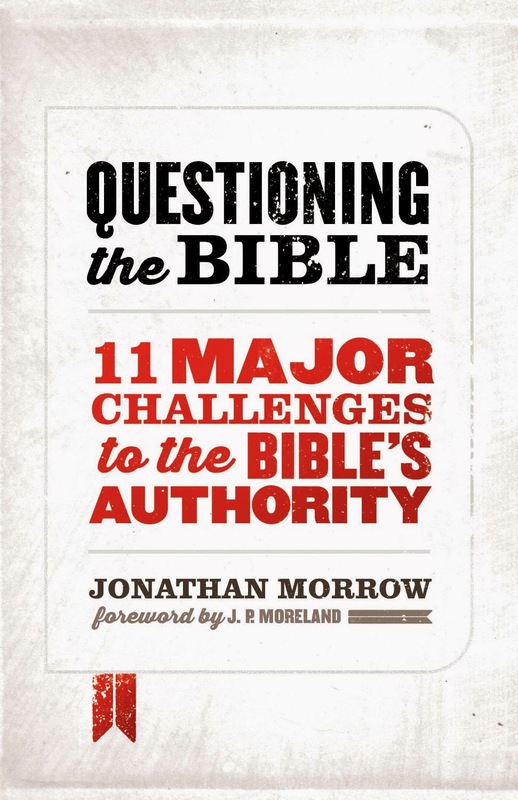 Jonathan Morrow's new book "Question the Bible: 11 Major Challenges to the Bible's Authority" (Kindle, Paperback, Video) aims to be an introductory resource for the Christian to rise to these challenges at an intellectual level. The book's 234 pages are divided by the eleven challenges and appendices. Morrow also includes, at the end of each chapter, a three-point summary, questions to spur discussion, and a short list of resources for more in-depth research into the challenges and their resolutions. This review will provide a chapter-by-chapter summary and conclude with the reviewer's overall impression and recommendation. Chapter 1: Is The Bible Anti-Intellectual? The first chapter has to get a foundational question out of the way: is the Bible against reason, logic, and intelligence? Morrow addresses three difference forms in which this challenges appears, including the ideas that it does not really matter what one believes about God, all religions really teach the same thing (so again, it does not matter what one believes), and that Christianity is merely a psychological crutch for those not strong enough. Morrow explains that Christianity does not claim to be opinion, but rather a way of making sense of the world that can be tested. He takes the reader through the common misconception that biblical faith is the same as "blind" faith. He shows that the Bible encourages trust based on reason even commands Christians to defend the truth of their beliefs using reason. The Bible is not a book of claimed fairy tales; it makes claims about the real world that demand investigation. Chapter 2: What Can We Really Know About Jesus? The primary claim of the Bible centers around a figure by the name of Jesus. Since the Bible's claims are about reality, then it makes sense to investigate whether or not Jesus actually lived and did and taught what the Bible claims. Morrow takes the reader through a brief history lesson of the quests to discover the historical Jesus (as opposed to the one recorded in the Bible). He then gives the current state of the quest. He explains the four sources used by historians to test which claims in the Gospels likely happened. Using the sources, critical scholars generally agree upon twelve facts that together provide a good synopsis of the biblical claims. Morrow recognizes that regardless of what even critical scholars accept, some people prefer to look exclusively at extra-biblical sources. He addresses this group by providing a summary of the life of Jesus given only sources outside the Bible. Finally, Morrow challenges the common internet claim that the story of Jesus is just a retelling of ancient myths. Chapter 3: How Do We Know What The Earliest Christians Believed? It is commonly argued that it is either not possible to know what the earliest Christians believed or that they believed something very different from what Christians do today. To address this challenge, Morrow uses the Pauline letters that critical scholars grant were authored by the Apostle Paul. Morrow shows how the information contained in these letters records that the Gospel that Paul was preaching was verified by the eyewitnesses to the Resurrection on two occasions and compares it to the Gospel that is preached today. However, without reading and writing being common in that time, it is argued, there was no reliable way to transmit such information from generation to generation, so we still cannot be certain continuity was maintained. Morrow explains that this challenge comes from a misunderstanding of oral cultures in general and the Jewish culture in particular. He shows how the Jewish scriptures, singing, creeds, and sacraments worked together to maintain continuity. He also reminds the reader that if one is to deny the reliability of oral transmission of information, then most of history is lost due to the majority of historical cultures being exclusively oral. Chapter 4: Why Were Some Gospels Banned From The Bible? It is commonly claimed in skeptical circles that there were much confusion and little agreement in the early Church about the books that were authoritative and that the choice of books in today's Bible was a "power play" by certain people who wanted to protect their positions of power. Morrow looks at this claim by contrasting this theory with the traditional Church understanding that the books were established early. He focuses his attention on building the positive case for the authority of the books being recognized early by examining the writings of several early church fathers. He concludes with a table that shows which books were agreed upon and which ones were disputed but finally accepted. He also takes a little time to examine the books that were not admitted. Morrow explains that these were lacking two important characteristics: written during the time of the apostles and historical/theological consistency with the already accepted books. The books that are often claimed as "banned" were not done so for arbitrary or nefarious purposes. Chapter 5: Did The Biblical Writers Lie About Their Identity? Morrow now moves to challenges to the books that are included in the Bible. He begins by explaining that it does not follow that an error exists simply because it is possible that an error exists and that absolute certainty is not necessary regarding a claim to know that it is true. Those immediately take the force from the challenges to the authorship of the gospels and many of the traditionally-accepted Pauline letters. But Morrow does not leave it there; he addresses the possibility that these books were written by someone other than the author historically accepted. He explains the apostles' awareness of forgeries and what they did to authenticate their writings. He also takes the reader through the importance of writing style in determining authenticity. Finally, he addresses each of the gospels specifically and provides the reader with resources for further study. Chapter 6: Has The Biblical Text Been Corrupted Over The Centuries? It is often claimed that the transmission of the Bible is much like the childhood game of Telephone: a message is whispered down a line of kids and the final message is nothing like the original. However, the Bible is nothing like that. With the telephone game, there is only one line of transmission and no way to compare versions within the line. The Bible has multiple lines of transmission that can be examined throughout the lines. This allows comparison and correction where necessary. Morrow compares the number of Biblical manuscripts to the number of other ancient writings along with the chronological proximity to the events they record. The biblical manuscripts out number the other dramatically and the proximity of the earliest manuscript found is within decades of the events and not centuries. If someone is to remain consistent in the acceptance of the reliability of other ancient historical records, they must also accept the reliability of the biblical records. Chapter 7: Are The Gospels Full of Contradictions? Almost everywhere Christians go skeptics claim contradictions abound within the Biblical accounts, especially in the gospels. However, these challenges do not rely upon a correct understanding of what a contradiction actually is. Morrow defines a true contradiction then gives several examples of commonly espoused "contradictions" to demonstrate how a proper understanding removes the challenge. He explains to the readers that eye-witness testimony can include differing details due to the witnesses' perspective or their perception of which details were actually important to note. Once someone understands the natures of a true contradiction and eye-witness testimony, it is not difficult to see how claims of contradictions in scripture are undermined. Chapter 8: Is The Bible Unscientific? It is quite common to encounter challenges that the Bible is unscientific. This often comes from the idea that it contains miracles, which David Hume famously offers four reasons for doubting. Morrow addresses each challenge to demonstrate that miracle claims are not as unscientific as Hume claims. Next, Morrow discusses two arguments for God's existence that draw their premises directly from the sciences. Genesis 1-2 is often cited as being unscientific because of certain popular interpretations that stand against observations from nature. While Morrow does not take an official position on the proper interpretation, he does provide a table with the most popular ones. He does this to demonstrate that Genesis 1-2 has multiple possible interpretations that do not place it in direct conflict with the sciences. Chapter 9: Is The Bible Sexist, Racist, Homophobic, and Genocidal? The Bible's critics often misrepresent scripture as supporting sexism, racism, homophobia, and genocide. These accusations are quite powerful because each behavior is wrong and is passionately opposed by Christians. However, when scripture is examined in more detail and in context, the accusations are found to not be correct. Morrow does this by taking the reader through five points on each accusation that is necessary to understand the contextual details and see that the claims are misplaced. Chapter 10: What Do Christians Believe About The Bible? This is an important question to answer because it will guide a Christian's study of scripture and how they apply it to their life. Morrow explains that studying scripture is important to loving God with all our minds, carrying out the Great Commission, building a relationship with God, and being able to avoid wrong understandings that will compromise the other three. Understanding that the Bible is the revelation of a consistent God is important to our study because it provides the framework of consistency throughout scripture for determining its meaning. It is understood that anything that the Bible speaks about is truthful. Further, since nature is the creation of the same God, the Bible will never contradict what is found in creation. Both revelations are consistent within themselves and between one another. Chapter 11: Which Interpretation Of The Bible Is Correct? Understanding the proper way to interpret scripture is important to the study of it. Morrow explains that many people like to believe that meaning of a text is determined by the person who is reading it; however, he explains that since this would not work in everyday life and would lead to communicative chaos, it is not wise to search for meaning in the reader. Rather meaning is determined by the author, and understanding the author's context is key to understanding what they meant in their writings. Morrow provides a short outline of several contexts that must be considered when looking for the correct meaning of any passage in scripture. Morrow concludes the book with a call to the next generation of Christians to take what they have learned and apply it to their evangelistic efforts and to the strengthening of their relationship with God. Today's postmodern and quasi-tolerant culture is constantly attacking any ideas, publications, and people who claim to hold exclusive authority over any person. Religion, in general, and Christianity in particular, seem to be the preferred targets. The Bible's authority is challenged from every angle imaginable. Every Christian; whether young or old, weak or strong; is bombarded with claims that are intended to either slowly erode or instantly decimate their trust in its historical reliability and absolute authority in their lives. These challenges are not relegated to the distant halls of advanced academia or the streets of Hollywood, they come from everyday people at our workplaces, in our schools, and even within the Church. Yet the average Christian is not equipped to deal with these challenges to their spiritual growth and their witness to the world. Jonathan Morrow has put together an excellent book to equip the average Christian to rise to several of the most common challenges to the Bible. Because of the specific challenges that he chose to address, this book will appeal to the small group leader who wishes to prepare a group for the challenges. Often pastors and group members do not see the need for such a study and are skeptical of its value because of the "argumentative" or "faith challenging" nature of such topics. For any Christian who is engaged with the world, this book will have immediate application. Morrow's tone and treatment of controversial subjects are gracious and loving, and he highly encourages this attitude among his readers. This reviewer cannot recommend "Questioning The Bible" enough for anyone who wishes to introduce their small group or local church to the defending the truth of Bible's authority.